Yup, you guessed it. I was procrastinating the other day, stuck on an editing point, and got hungry. I’m five pounds away from my goal weight, so of course, I decided to bake cookies. But instead of the usual decadent chocolate chip recipe on the back of the bag, I decided to switch things up. I do this all the time, but usually, I forget to write down what I’ve done, so if it works out, I can’t repeat it. 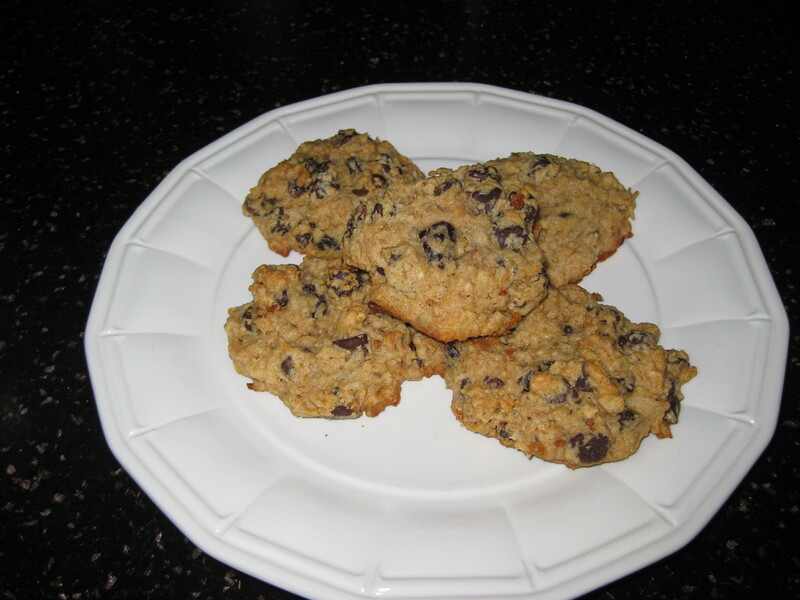 Well, this time, I remembered – and they turned out to be awesome cookies! 1 cup brown rice flour, 1 cup old-fashioned oatmeal, 1 cup trail mix (no fruit), 1/2 cup coconut, 1/4 cup ground almonds, 1/2 tsp. salt, 1 tsp. baking soda, 1/2 tsp baking powder, 1 tsp. cinnamon. Grind the oatmeal and trail mix coarsely. Combine with rice flour, coconut and almond meal. Add the rest of the dry ingredients. In mixer, blend butter and peanut butter. Add eggs, then honey and mix until smooth. Mix dry and moist ingredients until blended. Okay. At this point, you can get creative. (As if this isn’t creative enough already!) I added 1 1/2 cups dark raisins and 1 1/2 cups chocolate chips. Alright, alright, yes, there’s sugar in the chocolate chips. Don’t add them if you want to be a purist. Add chopped apricots or dried cherries instead. Dates would be good. I love dates. Drop by spoonfuls onto buttered baking sheet. Bake at 375 degrees for 12 minutes, or until golden. Try them. Let me know what you think. So this month, I’m working on the first draft I wrote in November… of 2008. Yup, NaNoWriMo ’08. What can I say? It’s been a writers-block kind of year. But I’ve recently discovered National Novel Editing Month – NaNoEdMo to us word-geeks. And in an interesting display of synchronicity, I learned of EdMo right after signing up for an editing class at Simon Fraser University. And since the second Shelby James book is already on an editor’s desk, I guess it’s time to get the third one polished. In a fortuitous bit of synchronicity, as we’re climbing over the people in the seats next to ours, I suddenly recognize the person whose lap I’m about to fall into: Donna Milner, a writer friend of mine. She shrieks, I shriek, we hug, it’s a beautiful moment. But the concert was about to start, so we saved it for intermission. The music was amazing. The VSO, well, what a treat. And Judy? For a 70-year old gal, she’s still got it. Wow. At the break, we caught up on each other’s lives in the bathroom line-up. Donna happened to be in Vancouver visiting family, so she and her husband got tickets to the concert. She and I met at a writers’ conference many years ago. Since then, we’ve kept in sporadic touch, but only see each other every few years. Of course, we follow each other’s careers with sympathy and interest. She asked about me, I shrugged and said, nothing new to tell. (I didn’t mention the sore neck or dog crap.) Just said I’m still writing of course, but no one’s buying at the moment. She looked shocked. Horrified, actually. Why hasn’t the publishing industry recognized my genius? Why hasn’t my brilliant writing launched me to heights of stardom? She was quite wonderfully put-out on my behalf. Donna’s story is more interesting, anyway. She hit it out of the park, first time out, with her book After River, which I’m proud to say I own both in hardcover and in Advance Reader’s Copy. I’m talking a two-book contract, major publisher, hard-cover and paperback, with rights sold in numerous countries in a variety of languages. Donna deserves the success; it’s a wonderful book. She told me, with bewildered pride, that the Germans in particular love her and have done a trailer for the book. So, surrounded by wonderful music flavored with nostalgia, I was reminded that I have good friends out there, who are rooting for me as much as I’m rooting for them. And that my dear husband, who occasionally buys tickets to great concerts totally spontaneously – just because – is my biggest fan. PS: My neck feels better today, and I’ve figured out one of my plot problems. Coincidence? I think not.